I remember as if it were yesterday, the day I worked this out. In fact, it was back in 1980. I was working in front of a flip chart, something I like to do, and I was trying to work out something I had been aware of for a long time as an aspect of the creative process. It was the irony of being in two places at the same time. Often when writing music, I’d be both in the moment and, simultaneously, in the future outcome of what I was writing. I needed to express this experience graphically, because when I tried to explain it to others, they translated what I was trying to say into something vastly different, usually something metaphysical. 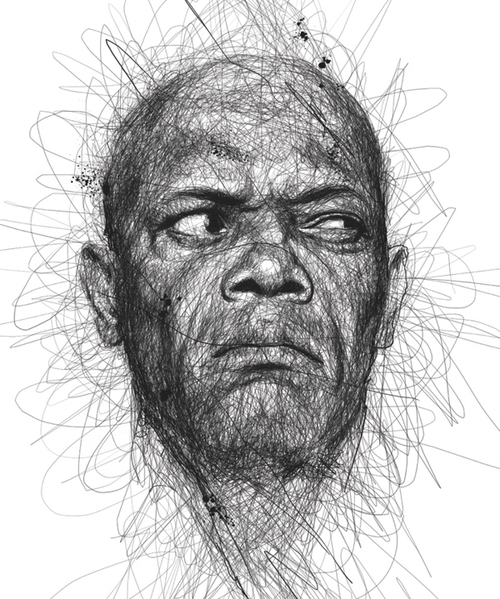 But I wasn’t working with metaphysics, I was working with something much more powerful – the creative process. Most people underestimate the power of the creative process and over-estimate the power of metaphysics and other belief systems of all kinds. But belief systems haven’t produced a fraction of what the creative process has. Think of the long and great history of the arts, music, and science, and you will see that the creative process is basic to these realms, while whatever you happen to believe is irrelevant. Of course, those in what I like to call the “belief business” want to validate their beliefs by pointing to various desirable outcomes of holding their particular belief. But if we did a match up, we would see that they would have nothing to compare to Bach, Beethoven, Picasso, Stravinsky, Walt Disney, Georgia O’Keeffe, Hemingway, Edna St. Vincent Millay, Robert Frost, and the list would go on for days. It is common to turn something good into a belief system. But then you lose the essence of what you’re talking about. The creative process doesn’t call for belief, and whatever you happen to believe, personally or on the level of a worldview, is completely irrelevant. Of course, those in the belief business hate this idea. After all, they are usually pretty narrowly committed to a single belief system that does not allow for other possibilities. You know, “the one right way…” But in the arts, people have had every type of belief you can think of, and sometimes many more than one, even contradictory beliefs at times, and they still have been able to master their own creative process. This is more proof about the irrelevance of belief to mastery of the creative process. So there I was in front of the flip chart, not knowing what I might work out. I put a box on top of the sheet, and wrote “vision” in that box. What I meant was a picture or image or understanding of the outcome the process was designed to produce. I wasn’t thinking about mental processes, but just the object of the whole exercise. This process is designed to create that result, plain and simple. Then, to describe the second part of the experience, the “here” in the “here and future.” I wrote a box on the bottom of the sheet. I wrote in the phrase “current reality.” I was trying to locate two things in this one box. One was the current condition in the creative process, that was the “reality” part. The other was that conditions change as we move. That was the “current” part, to update reality as it changes over time. Two boxes on a flip chart, one at the top and one at the bottom. I backed up and studied it. Seemed pretty simple and obvious. No big deal…YET. And then my years of structural training in music hit like a ton of virtual bricks. The difference between the two boxes formed a tension. In tonal harmony, the tension is the most dynamic and powerful structure there is. It is the structural dynamic that enables music to move from one moment to another. The experience of being both here and there in the creative process became crystal clear, it was the same as holding a harmonic tension, which would naturally lead to resolution. This is exactly the point that the physicist Hermann von Helmholtz made in his classic book, The Sensation of Tone. And it has been well understood and used through centuries of music-making. The power of structural tension, which is what I named this form, is that the difference between the desired state and the actual state creates a powerful state of “non-equilibrium” that has a built-in dynamic, to restore equilibrium. All of nature and physics strives for states of equilibrium. Often, there isn’t a strategic dimension to the structures. Rather, things turn out to be in conflict with other things, and those conflicts fight against each other as the system strives for something it cannot achieve – equilibrium, bringing harmony to all parts of the structure. But structural tension is very strategic and deliberate. I like to use the following illustration to describe the point, which is, an archer stretching a bow, aiming the arrow at a target. The tension in the bow enables the arrow to be propelled to the target. Structural tension has the same structural dynamic, which is adequate tension generates energy toward the target: the desired outcome we want to create. Over the years, some people who have tried to adopt structural tension describe the space between the outcome and the current reality as a gap. I always find this rather silly. A gap is the absence of something, an empty space. Jeffrey Horne has created a list of stars who have gaps (space between their two front teeth called diasthemas). The list includes Michael Strahan, Anna Paquin, Steve Wilkos, Madonna, Samuel L. Jackson, Eddie Murphy, Lauren Hutton, Eve Myles, Brigitte Bardot, David Letterman, Glenn Jacobs, Mike Tyson, Denis Leary, C.M. Punk, Anthony Anderson, Wesley Snipes, Woody Harrelson, Arnold Schwarzenegger. These are example of people who have a gap. 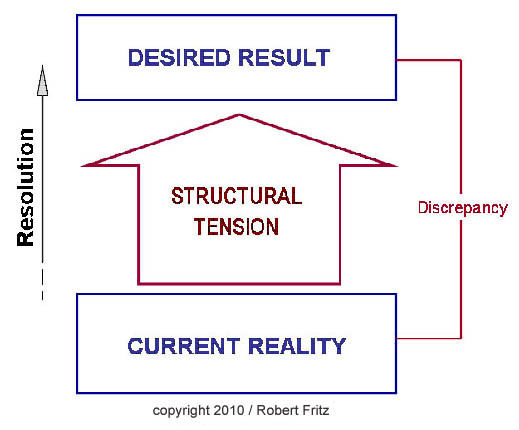 The space between the desired outcome and current reality in structural tension is not a gap, the absence of something, but a tension, the presence of a dynamic force. This dynamic helps you in two special ways. The first way is the how the mind is engaged in the creative process. Often, as part of current reality, there isn’t enough time or money to accomplish the goal by traditional means. So, the mind begins to work out just how you might be able to create this outcome in non-conventional ways. This dynamic is the root of innovation. Creativity is motivated by the structure, and the mind targets the process by generating useful ways to get where you want to go within the means you have available. This is not brain storming, which comes from the notion of “freeing the mind.” This is how it really goes for professional creators, which is to focus the mind. Instead of coming up with a “brainstorm” of mostly terrible ideas with one or two maybe workable ones, the mind is working to create resolution to the tension that’s been created. It comes up with focused and useful ideas. The second way that structural tension enables you to create is by generating energy in the action steps you will need to take. Rather than pushing boulders uphill, you are working with the forces in play, often creating an economy of means, and elegance of process. You don’t have to manipulate yourself into action. You are highly motivated to act. Almost everything you do in life can be done within the context of structural tension. Most people have be trained to think in terms of problems to solve or situations that demand reactions or responses. Rather than a circumstantial orientation, your life can be a series of iterations of the creative process, an orientation in which your choices rather than your circumstances become the central organizing principle in your life.